How to improve your business through online learning? In order to survive the highly competitive market scenario, business enterprises have to constantly update their knowledge and upgrade their skills. A Face to Face meeting and learning from an expert is one way, it is not always possible to meet up with an expert. An alternative way to do this, is by online learning. Aurion learning’s statistics reveal that 41% of the top business houses attributed an increase in their revenue to online learning. Also 91% of the Learning & Development leaders feel that learning technologies enable a quicker response to changes in the organization and the business conditions. Training has existed for years but now there is a paradigm shift from organizing classroom sessions for staff to both the owners and staff being signed up for online learning sessions. This is because online learning is a flexible and portable platform that benefits business in numerous ways like the ones listed below. Business heads are the masters in their own industry but their knowledge of new or contemporary industry practices and techniques may be limited. Simply because, there is always so much do in business, that taking time off to “learn” seems a challenging task. Online learning offers the best and latest industry-centric training from expert consultants whose expertise is wide-ranging at a time and pace of the learners choice. Unlike classroom lectures of earlier times, online learning has interactive multimedia inputs like videos, slides and animations. ( don’t say classroom lectures are bad. We do a lot of classroom sessions ourselves and there is merit in class room sessions. We are moving to an omni channel model where both classroom and online will co exist. So, please do not say, classroom is not good. This help the viewer to grasp the information faster and retain it better. Employees who have received online training had 25-40% more retention than others. Some organisations do both classroom and online training to help get the best of both worlds. Online learning has been found to improve business productivity and efficiency by 50%. This is because online learning gives first-hand examples or real case studies by means of videos and presentations etc which can be viewed multiple times by the user It is possible to go back to a particular section again and again. This helps learners to understand concepts better through visual aids. According to a recent survey, 71% of the CEOs feel that human resources are the main asset of any company. While the Classroom training has its own advantages, it also involves many costs like venue, travel, learning material, catering, printing material etc. Often, the costs of organisation is higher than the actual “cost” of training like the training content development and trainer fees. These expenses can be better utilized in online training, with better quality of online content, etc.Online learning’s biggest benefit for businesses is its ROI. Online learning is the most convenient mode of learning for busy business owners and executives as the learning can be done via a mobile phone, tablet or PC. It is also accessible 24×7 and information can be gained at the viewer’s convenience. Since it is web-based learning, it is also accessible from any geographical location making remote access and collaboration easy. Users can learn at their own pace and control the duration of the course. Infact, some retailers are allocating a training time table like a lunch timetable, weekly off time table, so that staff are asked to study the material in a particular time and day on a weekly basis. An hour a week is more than sufficient and can be scheduled properly for every staff in the store too. Entrepreneurs need to be in tandem with the market changes and learn to adopt new techniques. Since online learning materials can be easily updated, entrepreneurs can take advantage of the latest inputs and trends. Online learning helps students to access the course materials any time since they are stored as web resources. busy businessmen need not worry about missing a session as the videos can be viewed later. Online learning offers the facility of providing instant feedback on clarifications raised by the viewers irrespective of where they are Chat sessions and reply to mail facilities help the viewers to record their doubts and receive feedback both instantly or at a later time. Online learning helps to monitor your individual progress through online assessments and quizzes. Complete understanding is thus ensured. Smart entrepreneurs use online learning for training their staff as with cost effective investments, (Multiple types of payment options exist – Per session, Per program, Per month, Per User etc. The online sessions can be used repetitively till the expiry of the course which is of huge advantage to the bottom-line. Why online learning is a must for Jewellery retailers? Jewellers are busy businessmen who cannot afford to spend time by being away from their showroom. 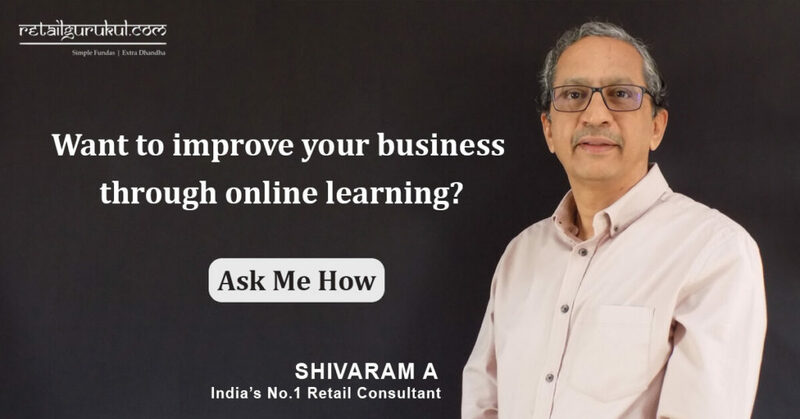 Online learning helps jewellery retailers to save time and money by allowing them to use the sessions at their convenience right inside their showroom for any length of time, stop it to do other tasks and come back to the learning sessions. .
Due to the uncertain nature of the operations in retail, when there are “pockets of free time and pockets of business”, it is necessary to use the free time to improve the business. Online learning and training helps learners utilise this time very effectively. Online Learning opens the eyes of entrepreneurs to new business concepts of international standards which are personalized to their scale. 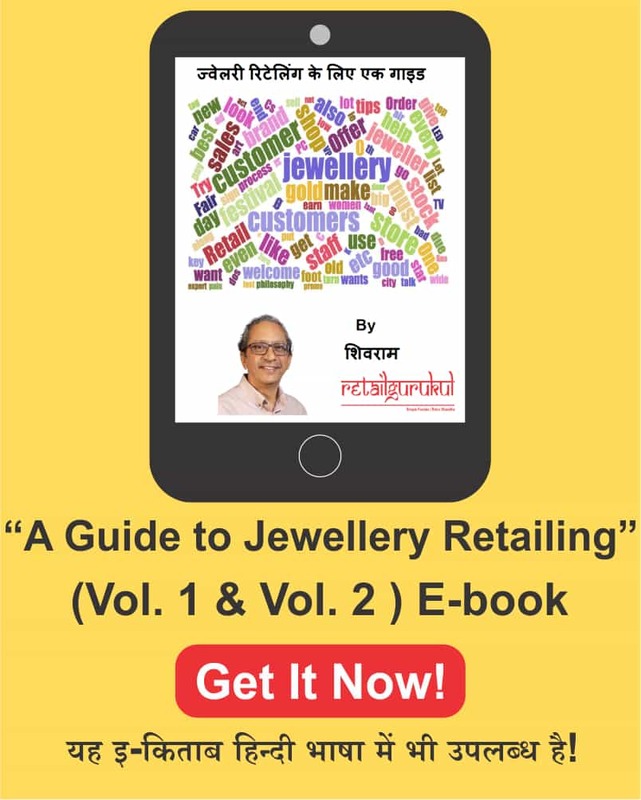 Grab this unique opportunity of gaining inputs form this valuable course on Jewellery Retailing called “Vitamin Money for Progressive Retailers”. 5 Tips to Better Retail Sales Management to grow your business.